As this is written Monday morning, September 18, the VoIP Hurricane Net will activate starting at 11 AM EDT/1500 UTC until further notice for Hurricane Maria and impact to the Leeward Islands over the course of the afternoon and evening. WX4NHC, the Amateur Radio station at the National Hurricane Center in Miami, will be active starting at 5 PM EDT/2100 UTC Monday evening for the same purposes. Maria will likely track toward the US Virgin Islands and Puerto Rico later Tuesday and Wednesday with possible tropical storm impacts to some of the northern Leeward Islands during the day on Tuesday. Hurricane Jose is expected to bring tropical storm conditions to portions of the northeast US and potentially the Mid-Atlantic states Tuesday and into Wednesday. Jose is expected to slowly weaken to a tropical storm over the next couple of days but has a large tropical storm force wind field affecting these areas. At this time, the VoIP Hurricane Net will focus on Hurricane Maria and her impacts on the Caribbean islands since direct hurricane impacts are expected and local/regional SKYWARN groups will handle Jose's impacts in the Northeast and Mid-Atlantic states but any SKYWARN criteria reports received from Jose by the VoIP Hurricane Net will be given to the NHC via the VoIP Hurricane Net web form. Any Amateur Radio operators in the affected area of Maria or with relays into the affected area of Maria are asked to provide surface and damage reports into the VoIP Hurricane Net for relay into WX4NHC. The VoIP Hurricane Net is looking for reports based on the National Weather Service SKYWARN Reporting criteria, found here. Any images or videos of wind damage, river/stream/urban/storm surge flooding, etc., can be sent to this email address: pics@nsradio.org and credit will be given to the Amateur Radio operator, weather spotter or individual that took the photos and media and be shared with the Amateur Radio team at the National Hurricane Center and other agencies and outlets. These pages contain news reports, summaries of resources and links to other key components of the mammoth disasters' response. If you were -- or are -- involved as a volunteer radio operator, please send your reports of activity to your Section Emergency Coordinator so that the amateur response effort for these two disasters can be fully documented for numerous purposes, including lessons learned and spectrum defense in the future. It's important -- thank you. 09/14/2017 -- As requests are received asking for Amateurs to travel to the areas affected by Hurricane Irma, ARRL officials are reminded that to be covered under the Volunteer Protection Act or the MoU between ARRL and the American Red Cross, requests for volunteers must be submitted through established ARRL/ARES channels. Get with the SET: ARRL Simulated Emergency Test (SET) Fall Classic Just Ahead! 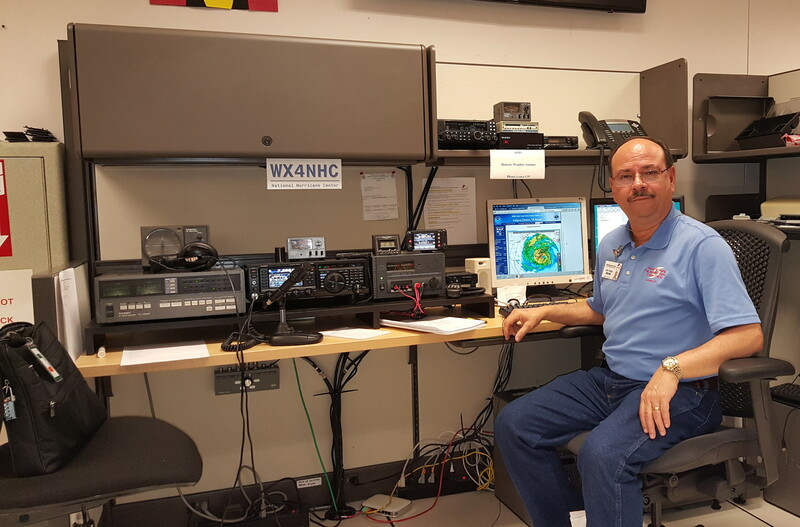 I operated the station WX4NHC at the National Hurricane Center in Miami for Hurricane Harvey. My slot was the very long Friday night of August 25, during Harvey's landfall in Texas. As I tuned into the weak signals, I could sense the stress in the voices I heard through the static of the radio. As the hurricane winds got closer to land, fewer and fewer signals were heard and then there were none. I assumed operators in the storm's path lost power, antennas or both. But I could not escape the images in my mind of what they were going through: the howling of the wind, the darkness, the crashing noises, the crying children, remembering 25 years ago when Hurricane Andrew took the roof off my house. I watched the back-to-back forecasts and satellite images as Harvey rapidly strengthened from barely a Tropical Storm into a major Category Four hurricane in a very short time. As Harvey approached the Texas coast that night, we had a sense of the devastation that would result from the 130 MPH winds and possible storm surge. But when it slowed down, and then stalled over the Rockport and Houston area, the rain forecasts went off the charts. The flooding would be historic. Recently, members of Orange County, California's Hospital Disaster Support Communications System (HDSCS) had the opportunity to attend a class on "Psychological First Aid" put on by the Behavioral Medicine section of the Orange County Health Care Agency. The class addressed not only ways to deal with the psychological issues of victims in a major emergency but also understanding that the caregivers and helpers in those situations can often become victims themselves. Ways to deal with those issues were provided. On Thursday, August 24, the Olympic Peninsula in the Northwest corner of Washington State came alive in preparation for an Active Shooter Exercise. The exercise took place on the Peninsula College campus in Port Angeles, Washington, and was planned and coordinated by the Clallam County Sheriff's Department and the Port Angeles Police Department. This exercise was the largest of its kind conducted on the peninsula, and included participation from federal, state, county, city, and tribal authorities and public service organizations all over the area, including ARES. The public safety agencies along the Gulf coast have done a lot over the past ten years to make their communications systems - including radio and Internet -- more robust and hardened for integrity in major storm events. Their efforts, combined with the FCC requirement for narrow banding and the addition of digital modes at the same time have made these systems more complex - yielding more possible points of failure. But in the end, in both the greater Houston and Golden Triangle portions of the Texas Gulf Coast, Hurricane Harvey did not knock out, nor significantly impact the cellular telephone and data networks or the 700 MHz and 800 MHz trunked public safety communication service systems. There were some threats but no significant impact. ARES/RACES operators were prepared, in place, staffed and ready to go, if needed. My concern is that not only will our served agencies find themselves lured into a false sense of security, so will the Amateur Radio community. We amateur operators have the ability to, and must control one side of that equation: We can continue to train, practice and exercise. We can complete the courses Introduction to Emergency Communication (EC-001); Public Service and Emergency Communications Management for Radio Amateurs (EC-016); PR-101: ARRL Public Relations (EC-015). We can take and complete the FEMA Independent Study (IS) courses IS-100, IS-200, IS-700, IS-800 and IS-026. Both ARES and RACES leaders should add IS-300 and IS-400 courses to their resume. All should get into a DHS AUXCOMM class. Leaders should try to take the DHS COML course even if they never get DHS certified. As PIO's who also wear an ARES/RACES hat, in addition to the PR-101 course offered by the ARRL, they should take the FEMA IS-042 and the GS-289, GS-290, and GS-291 courses. In addition to the educational portion described above, we also need to continue to practice our on air skills. Personally, I find that most nets are not fulfilling their potential in the practicing of emergency/disaster response communications skills. To help nets meet their potential, one action they could take is to hold at least one monthly session where all operators take their go kits to the field -- even if it's just the Wal-Mart parking lot down the street -- and check into the net. Not every ham can "go portable," but the more who can, increase the utility of our organizations. That utility is important when it comes to emergencies and disasters such as what we have just gone through here in the Houston area where maybe as many as 1 out of 6 homes were rendered uninhabitable. Also, net check-ins, whether novices or veterans, sometimes do not listen to the instructions of the net control station. We were given two ears and one mouth to be exercised proportionally. During the Harvey disaster, I observed that net operators and net control stations could use more net discipline for great efficiency and efficacy. The lowest common denominators for ARES/RACES emergency/disaster response are still the workhorse V/UHF FM and 40/75 meter phone bands. While the digital modes can certainly bring value, they cannot replace our lowest common denominators as not every ham is so equipped. As our served agencies' communications systems have become more complex with more possible points of failure, we do not need to repeat that model less we set up to fail as well. Outside of the major metropolitan areas many of these more elaborate digital modes do not see the light of day. Every ARES/RACES/CERT responder needs to have a "brag book." This phrase was coined by a friend and new ham who says every amateur licensee should have a book with copies of any license, I-D, certificates, etc., in it to present to a served agency official or other person who may have a need to review their credentials. documented training from recognizable organizations. Understanding your served agencies' communications systems, whether a simple 5 channel narrow band FM radio or complex multi-site 700 MHz P25 protocol system, and being able to discuss where Amateur Radio can fit into their system to either back up or take load off their system helps. Opening up your brag book and explaining that you understand ICS protocol, and our place in the system and are continuing to learn more, all help. Volunteer to participate in any of their drills, and not just as a radio operator. My city runs several a year as we are in a large petrochemical complex and I've served everywhere from in the EOC to an observer/evaluator in the field.